For many years, I was under the sad impression that a person's kindness made that person vulnerable, or weak. The more I learned about people - the more I got to see, I realized that kindness is not weakness; instead, it is of the utmost strength. Along with other attributes worth noting, those of us who possess intrinsic strength generally do not show tendency to trample upon the lives of others. I've been blessed to know many strong people, and here are eight characteristics they share in common. When she experiences sadness or suffering, she does not dwell on it and exist in it; she exploits it; utilizes it to shift her perspective, then moves forward. Wisdom is gathered from their mistakes. They refuse to crumble under the weight of their errors. If something is not working, they fix it then move on. There is no dwelling on the bad or unfortunate. Other who are less fortunate are viewed as people who can be lifted up; there's no need to step upon the downtrodden. There is no urgency to change any and everyone around them. They simply exist to progress forward. Strength is not prevalent in the way in which one fights in order to protect his/her opinion. It lies in the ability to be at peace with the differing opinions of others. Upon accomplishing goals, reveling takes a backseat to further progress and accomplishments. Gloating is a fool's indulgence. The people who accomplish great things often do not think of their accomplishments, but rather they focus on the work the remains to be done. 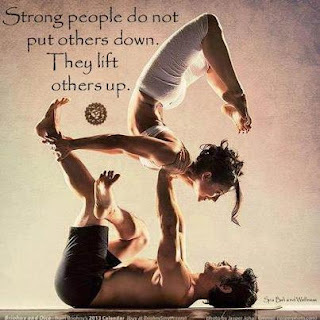 The strong serve as inspiration that will inevitably lift others up; I've never heard a person who possesses great strength say, "I'm strong because this and that..."
Their strength speaks for itself.